Our bodies are in tune with the 4:30 wake up. When we checked our watches and saw the time, we looked out of our tent and felt no wind and heard no waves. Don decides to make breakfast while Donna takes down the tent and packs up gear. We could see the light of the shrimp boats as they were heading back to the ports, still dragging their nets. The birds that were following the shrimp boats were announcing their successes. It was quite the morning chorus. As the sun was treating us to a spectacular sunrise a whale sounded in the distance. Sunrises do not get much better than this. This stretch of coast is exposed to the North, so we paddled steadily to get around Punta Chivato. The wind stayed mellow and the tidal currents seemed non existent. It was a good morning to be on the water. We rounded the point our view now included the nice houses of this area. It is quite the development that is continuing to expand southward. In the middle of the houses is a Mexican fish camp. It is quite the contrast with metal siding and outhouses. Pulling into a sandy beach for lunch we noticed lots of red coloring in the water. There should be lots of phosphorescent in the water tonight. 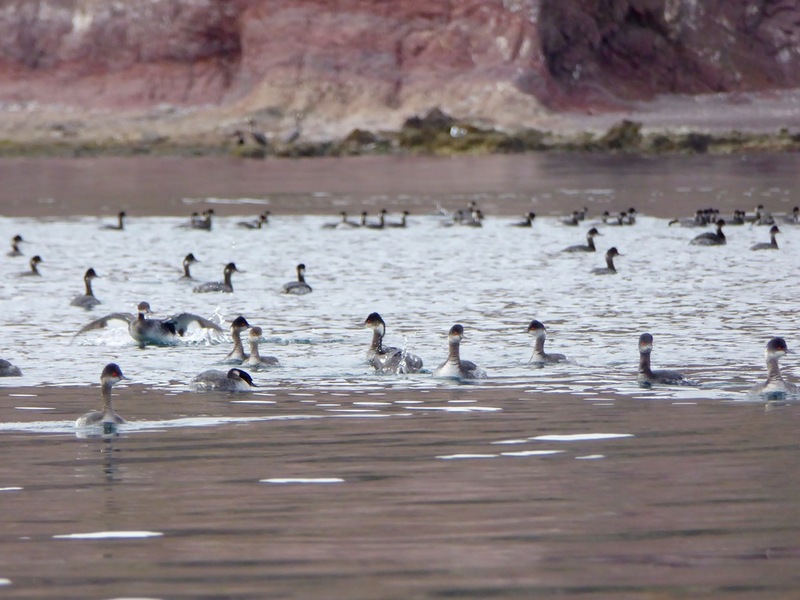 Several large rafts of grebes tempted us to try our luck at photographing them. It is amazing how quickly they can swim underwater. Currently our goal is to stop at a beach south of Mulege and spend the night. That way we would only have a 4 hour paddle tomorrow to get to where we started our trip a month ago. 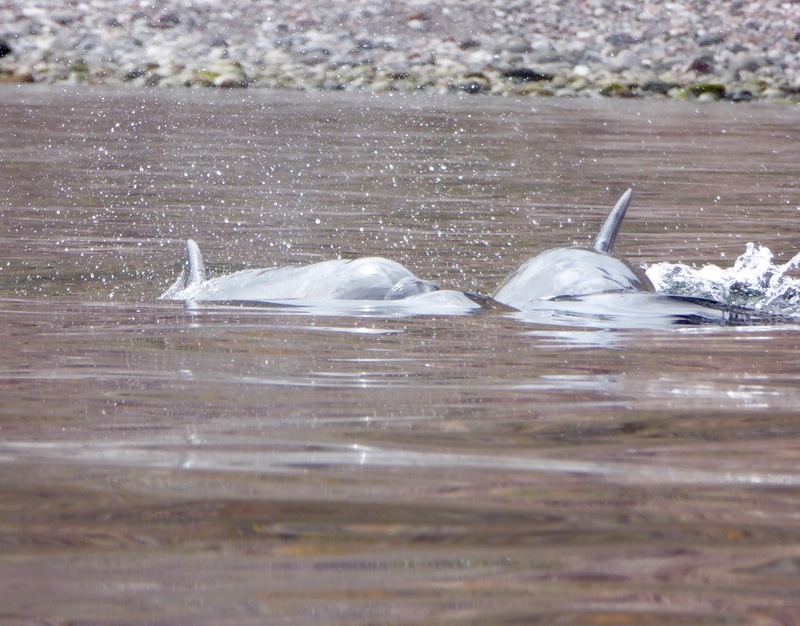 As we were making our way towards Mulege, several dolphins passed by. Then Don noticed a group of dolphins feeding close to shore. It was a dolphin feeding frenzy complete with dive bombing pelicans. There was a lot of red in the water which we initially thought was blood but on closer observation realized it was just the red tide. The tide is ebbing and so the shallow beach that we are landing on has quite the tidal flat. Since the tide will be ebbing for awhile we pull our boats out of the water and walk to the beach where we make ourselves an early dinner. Quesadillas with onions, mushrooms, cheese and peppers fill our stomachs. A cup of hot chocolate and we are thinking about moving. Our attempt at getting internet here is a failure. We can see the tower, but can not seem to have a connection. No worries, it was more out of curiosity than a need. The remaining part of the paddle is mostly protected so we did not need to get a weather forecast. 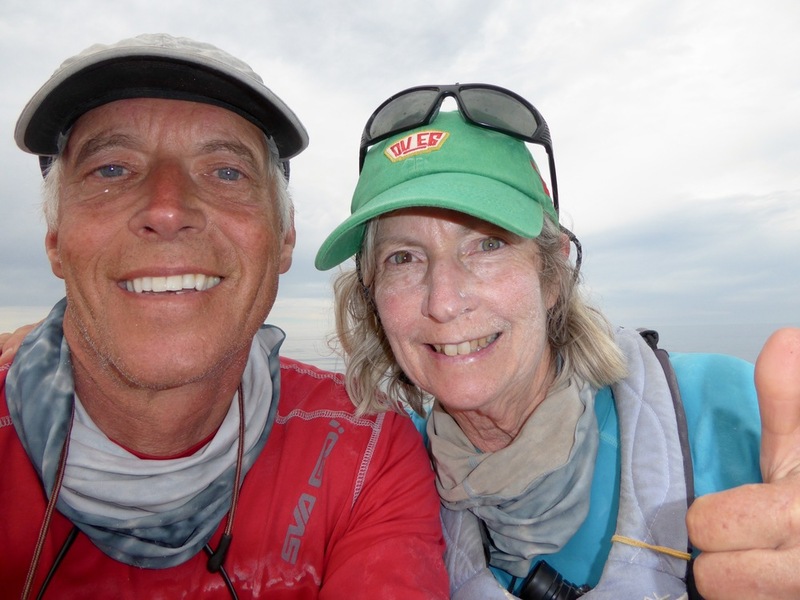 With a full stomach and calm seas, we decided to just go ahead and paddle the 4 hours tonight. there should be good moonlight and we know the way. With our boats heading to the south, the tide gave us a little push and then a little wind from the north added to our movement. Soon we saw the NOLS branch with the lights on. Greetings from some of the folks there welcoming us back. Soon our kayaks were unloaded and we were fast asleep in our sleeping bags with smiles on our faces!